At the end of a short dirt road in Iredell county, North Carolina, almost hidden in the trees, thereis a weathered grey farmhouse with a tin roof and a well in the side yard. It was here that Dempsey Essick found the scene pictured in "Miss Jane's Washday". Miss Jane, the owner of the house, is devoted to the simple, uncomplicated life of bygone days. She draws drinking water from her well and she washes her clothes by hand, just as her mother and grandmother did. Because she prefers to avoid the attention that accrues to subjects of Essick's paintings, Dempsey has honored her request to use only her middle riame in all references to "Miss Jane's Washday". The focus of the picture is a galvanized number ten (10) washtub which uses an old cane-bottomed chair for a support. The everyday plainness of the tub is contrasted with a beautiful capital-T pattern quilt which is crosslit by the sun to show every fold and the fine hand stitching of Miss Jane's grandmother. The viewer's eye then picks out all the other details which make the painting a frozen moment in time. 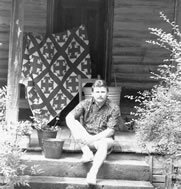 There is a chipped enamel pan, a bucket for catching rainwater, flowers in a lard tin, a date sratched in the concrete steps, the broken stub of a banister, and taking refuge in the shade besidea straw broom, Miss Jane's constant companion, a yellow cat named "Him." 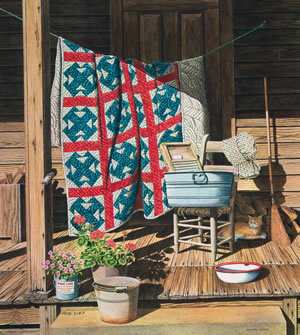 With "Miss Jane's Washday", Dempsey has captured a scene that was commonplace in the rural south of sixty years ago, before automatic washers and dryers. The realism of his paintings, from the rusty nail heads to the folds in the quilt and sunbonnet give his work a depth that draws the viewer inside the frame to become a part of the picture.